If Bob and I go for a walk these days, we don’t go far. We just amble around our yard. This is not an easy trek because the lawn is lumpy and bumpy. As we go I keep an eye on my husband in case he stumbles. In January, we never thought we’d be outside together this April. 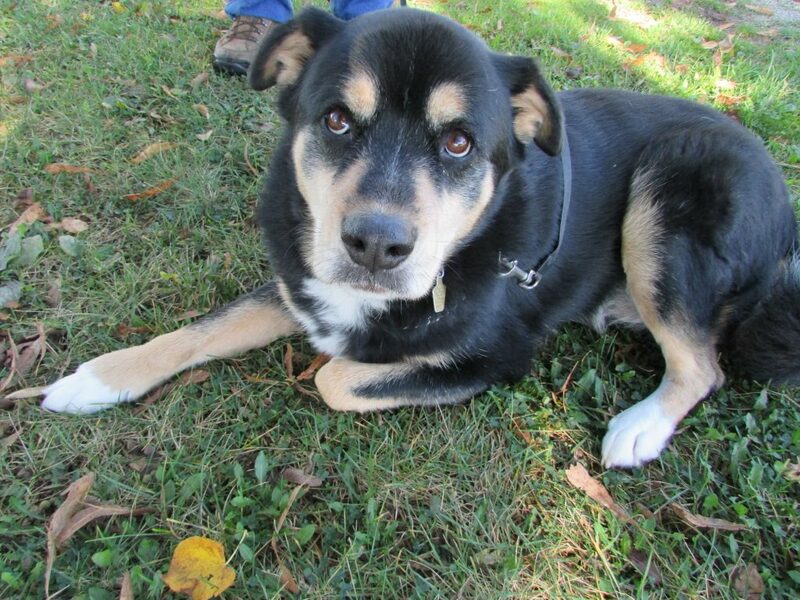 Bob’s cancer had come on so hard and fast it looked like it would take him at any minute. We are thankful for each day we have together. 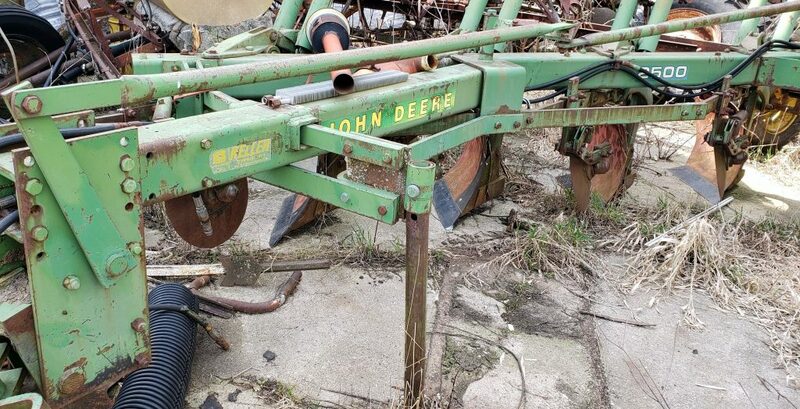 A slow walk around the shed is a good outing for us–Bob wanted to take a look at a plow he intends to sell and had me do some measuring of that machine. 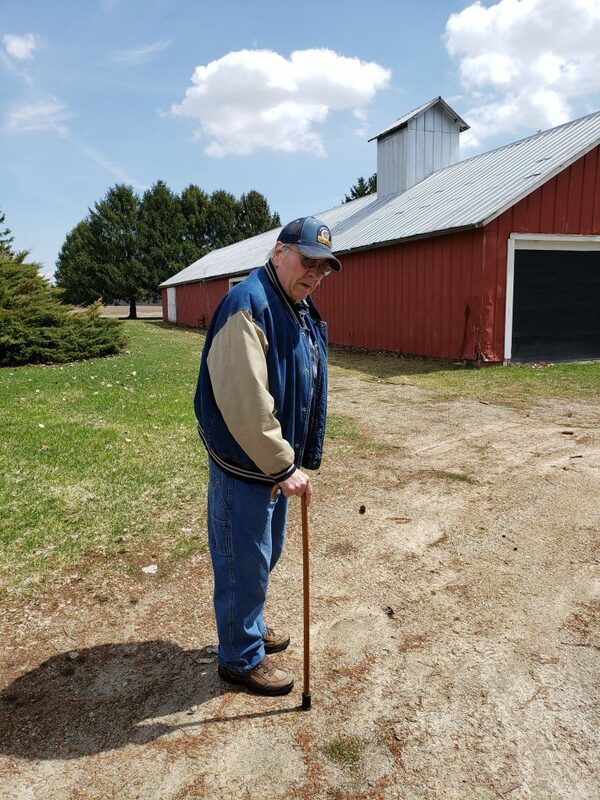 After checking out the JD plow, we headed back to the house where Bob took a nap. Another good day on Sunnybook Farm. I started clearing out old Adobe files from my laptop–the download file was where I began. The first files to go were odd newsletters I might have read… or not. Since I’ve been working on this computer for ten years, there’s a lot of junk I need to sweep out. The thing is I also found some files I lost–sometimes I’ve downloaded and saved a file only to forget to rename it. It’s then lost in the black hole of my computer hard drive. Many files got trashed and dumped but then I came upon a PDF from my uncle that listed family birthdays and death days. He also shared family stories from his brothers and sister about my mother’s family that I didn’t know or remember reading. I’m going through the papers now (I printed them out). My Grandpa Henry’s mother was a midwife in Chicago. It is thought that she delivered some of Grandma’s siblings. Henry and Josephine met and married in 1921. That was the beginning of the Fuchs, now Fox Family, that I know. (They changed their name after Mom was married so she was always a Fuchs.) When they were first married they opened a small store in Argo, IL, outside of Chicago. 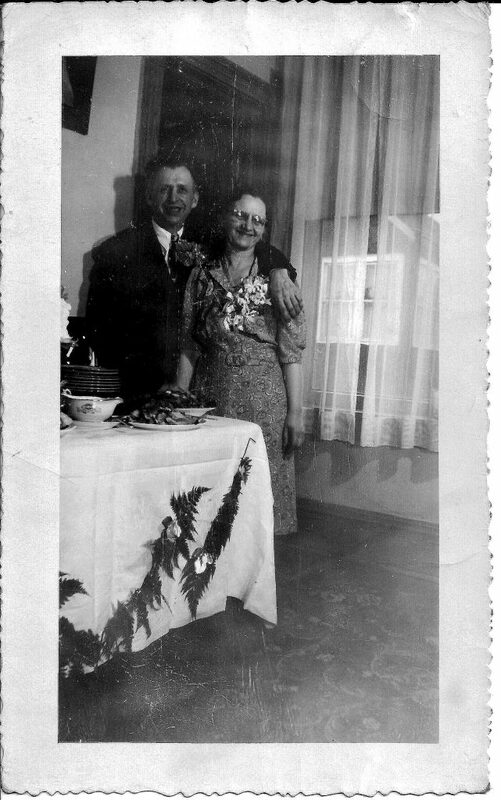 This photo shows Grandma and Grandpa as I remember them, or like to remember them before Grandpa had his stroke. Today’s assignment: Write down a memory. Othello has been our indoor pet cat for fifteen years. Cruella has been around our house for about ten years. They are not best buds. These two compete for everything, even for a spot in the sun. This photo shows a rare time when they came close to being together. 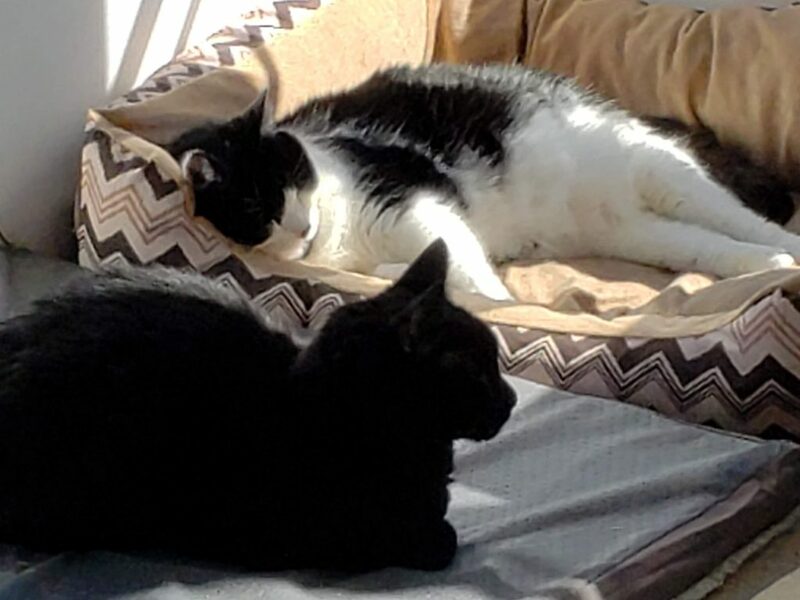 The sunshine drew them to the pet beds on our porch. It wasn’t long after I snapped this shot that they both moved. When Bob is on his recliner, both cats vie for a place on his lap. If one walks into the living room and finds the other already in the place of honor, I can see that the other is not pleased. Usually it turns and leaves–I’m sure mumbling under its breath cat curses. I had to share this rare site today. Let’s hope more sunshine is on the way for all of us. I think I’ll move my chair out where I can catch some rays on the porch, too. I love taking our dog, Sunny, for walks down our road. Sunny likes going, too. The most fun he has is when he finds the scent of deer who have crossed the road. As snow has faded, all the trash thrown from vehicle windows over the winter has become visible. There’s food containers, plastic bottles, and aluminum cans out there which I will pick up as soon as the ditch has less water. I don’t know why people can’t take their trash home and dispose of it properly, but a new arrival has me hopping mad. Someone is now tossing out glass beer bottles. I’ve found beer cans before, but glass is an extra hazard. Instead of a whole bottle, I ended up picking up glass shards right near our home. Sunny could have easily stepped on one and cut himself. Yesterday, I drove further down our road and saw an unbroken bottle on the shoulder. I stopped, picked it up. It is now in our recycling bin. Drinking and driving is bad news. So is tossing your garbage on the roadside. People wake up and clean up your act. Sunny doesn’t like finding broken beer bottles where he walks. 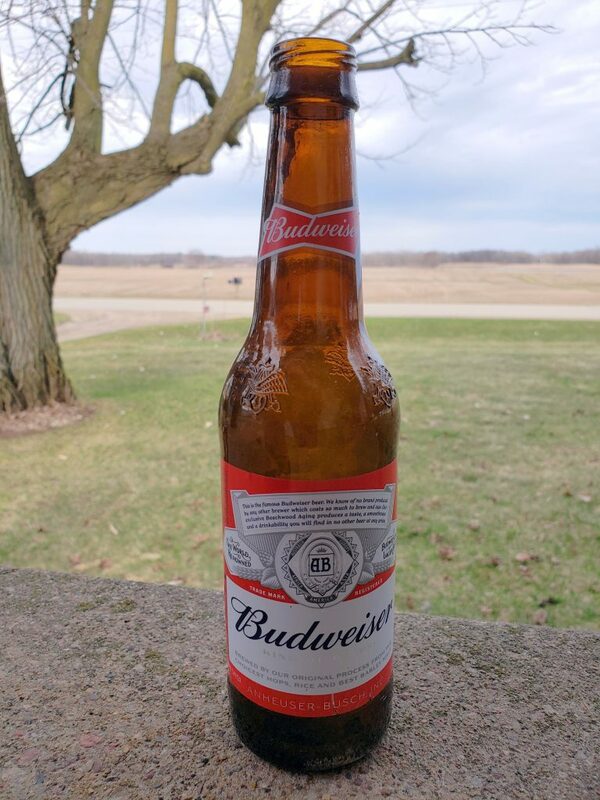 The beer bottle Susan retrieved from the side of the road. The Manzke family Easter dinner is next Sunday. Our children are heading to their in-laws today to celebrate. It’s quiet here, but that’s okay. Next weekend will make up for the quiet Bob and I have today. 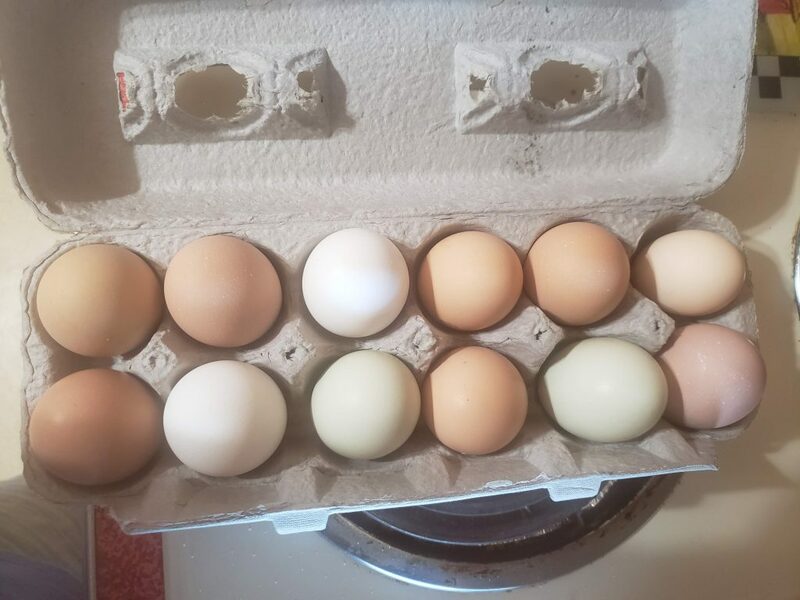 Here are my colored eggs. They are fresh from our chickens and colored by our hens. Thank goodness they finally started laying again. 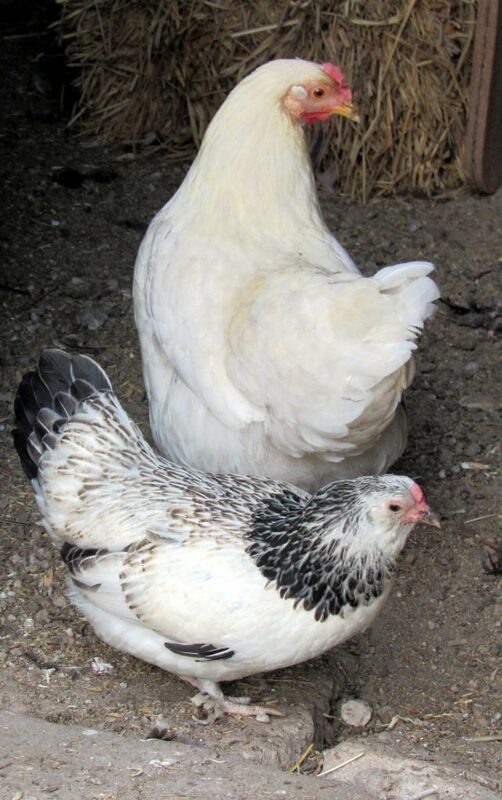 During our extra cold winter, the hens molted! I thought they would freeze to death, but they survived and are healthy enough to give us their cackle-fruit. May your Easter be filled with love and peace.